L-R: Orson Scott Card, David Farland, writer winner Matt Dovey, illustrator winner Adrian Massaro, Kellie Gerardi, and Sergey Poyarkov. Matt Dovey, a writer from Lincolnshire, UK and Adrian Massaro, an illustrator from Neuquen, Argentina are the Grand Prize Winners of the 32nd Annual L. Ron Hubbard Achievement Awards for Writers and Illustrators of the Future Contests. This was the first time in contest history that the winning writer and illustrator won for their work on the same story, Matt Dovey’s “Squalor and Sympathy,” illustrated Adrian Massaro. The awards ceremony was held at the Wilshire Ebell Theatre in Los Angeles on Sunday, April 10, emceed by Gunhild Jacobs, Executive Director for Fiction Affairs at Author Services, Inc.
Dovey received the Golden Pen Award and a $5,000 check on stage from writers David Farland and Orson Scott Card. Adrian Massaro was presented with the Golden Brush Award and a $5,000 check by illustrator Sergey Poyarkov and the awards show keynote speaker, Kellie Gerardi. Gerardi is a Space Science Strategist and Media Specialist of the Commercial Spaceflight Federation, one of 100 people globally currently being considered for space settlement to live on Mars. The inaugural L. Ron Hubbard Silver Star Award was presented to illustrator Sergey Poyarkov by Joni Labaqui, Director of Contests for Author Services, Inc. The award was given for his excellence as a science fiction and fantasy illustrator for the last 25 years. 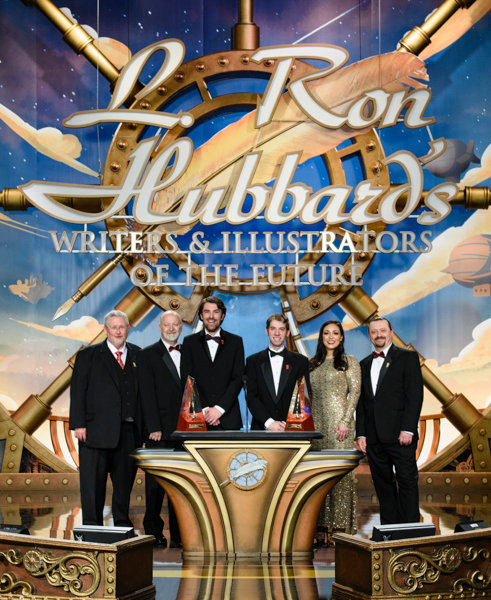 John Goodwin, President and Publisher of Galaxy Press, unveiled the 32nd Volume of L. Ron Hubbard Presents Writers of the Future featuring the work of 24 award-winning new authors and illustrators from this year’s contests. Edited by David Farland, with cover artwork by Sergey Poyarkov, the book also features stories written by Tim Powers, Sean Williams and Brandon Sanderson. This year’s 12 Quarterly Awards Winners of the Writing Contest were each presented with cash prizes and trophies. They included: Stewart C Baker of Dallas, OR; Matt Dovey of Lincolnshire, UK; Julie Frost of West Jordan, UT; Robert Graves (Pen Name: R.M. Graves) of London, England (who was unable to attend); Sylvia Anna Hivén of Lawrenceville, GA; Rachael K. Jones of Athens, GA; Ryan Row of Berkeley, CA; Jon Lasser of Seattle, WA; Stephen Merlino of Seattle, WA; Christoph Weber of Reno, NV and James Williams (Pen Name: J.W. Alden) of Hypoluxo, FL. In addition, a 13th writer, K.D. Julicher of Fernley, NV was selected as a Published Finalist for this year’s contest. She was in attendance at the event. This year’s 12 Quarterly Awards Winners of the Illustrating Contest were each presented with cash prizes and trophies. They included: Christina Alberici of Sewell, NJ; Camber Arnhart of Albuquerque, New Mexico; Brandon Knight of Shawbirch, Telford, UK; Talia Spencer of Los Angeles, CA; Adrian Massaro of Neuquen, Argentina; Killian McKeown of Phoenix, AZ; Vlada Monakhova of Edmonton, Alberta, Canada; Paul Otteni of Kirkland, WA; Jonas Spokas of Kaunas, Lithuania; Preston Stone of Loveland, CO; Maricela Ugarte Peña of Monterrey, Mexico and Dino Hadziavdic of Bosnia and Herzegouina. Event attendees also included 24 world-renowned writer and illustrator contest judges specializing the genres of Science Fiction and Fantasy. The 16 Writer judges included: Kevin J. Anderson, Dr. Doug Beason, Dr. Gregory Benford, Orson Scott Card, David Farland, Eric Flint, Nina Kiriki Hoffman, Nancy Kress, Todd McCaffrey, Rebecca Moesta, Larry Niven, Dr. Jerry Pournelle, Timothy Thomas “Tim” Powers, Mike Resnick, Dr. Robert J. Sawyer and Dr. Sean Williams. The seven illustrator judges included: Laura Freas Beraha, Echo Chernik, Larry Elmore, Ron Lindahn, Val Lakey Lindahn, Gary Meyer and Sergey Poyarkov. Since inception, the Writers and Illustrators of the Future contests have produced 31 anthology volumes and awarded a cumulative $930,000 in cash prizes and royalties. This entry was posted in Awards and tagged Illustrators of the Future, L. Ron Hubbard, Writers of the Future Contest by Mike Glyer. Bookmark the permalink. Speaking of L. Ron, did RAH ever pay him off on the bet about creating a religion? Because he created a doozy! This is very nice, Mike. Thank you very much. Sorry you couldn’t be there. Hopefully you were able to catch it (or at least part of it) as it was broadcast live on http://www.writersofthefuture.com. It is now on the home page for anyone to see. The opening performance, kind of like Stomp, was amazing!